Macworld always gets lots of coverage on the internet and in mainstream media. Every angle gets covered, every product dissected. So now that the dust has settled, and every man and his dig has had their say, what were the highlights, the lowlights and the meh-lights? Or, to put it in a far more dramatic way, the Good, the Bad and the Ugly. Quite rightly the new MacBook Air grabbed most of the headlines. Clearly it’s an engineering powerhouse and while it’s not the fastest, cheapest or best equipped ultra-thin laptop out there, it really is the best overall package. The size of the thing is just staggering. I thought the Time Capsule announcement is far more important than many people are making out. This is more than an add-on to the Time Machine feature, it represents what I believe is a move lead by Apple to serve storage as a service. If this product exists to serve the purpose of backups, it won’t be long until there is something similar that serves media. This is something I want to happen (I’m also planning to get a Time Capsule once some reviews are in), and I think it’s something that needs to happen. So this is a plus. One of the overlooked aspects of the MacBook Air is the Remote Media Drive feature. I think this is one of the features that really differentiates Apple from the crowd. They had a problem, no media drive, and they came up with an ingenious solution. There’s always something out of left field in an Apple Keynote. Something the fans don’t see coming at all. This year it was the addition of flickr support to the Apple TV. It’s another demonstration of Apple’s embracing of Web 2.0 services. We first saw it with the iPhone’s interaction with Google and Yahoo, and long may it continue. The big disappointment, especially for Europeans, is the lack of a 3g iPhone. I for one have been hlding on to my old phone awaiting an iPhone with a connection that makes the best use of the glorious interface. Going hand in hand with this is the fact that those who have placated their desire for an iPhone by picking up the iPod Touch will have to pay £13 ($20) for the pleasure of using some of the iPhone’s applications. The other bad point is a bit of a strange one. By introducing the Multi-Touch trackpad on the MacBook Air, Apple have effectively put a hold on anyone, including myself, buying a new laptop. I really want an need a new MacBook Pro but, until the Multi-Touch trackpad makes it in to the full range of Laptops. Everyone knows there’s an update coming, but no one really knows when. So it’s not worth taking the risk. Definitely coming down on the ugly side of things is the huge price increase we see, yet again, in the UK. Let’s take the Top Spec, SSD laiden MacBook Air. In the UK it costs £2028, that’s $3940 when converted. yet the exact same machine in the US Apple store costs just $3098, that’s just £1594. You read that right, the price difference for the same machine is, for all intensive purposes, £500. Why isn’t this illegal? It’s a similar story further down the model line, and with the Time Capsule. The other ugly announcement relates to the new iTunes movie rental service. Yes, renting movies is a great idea and is something that will clearly work online. What I don’t like is the DRM. Even though I’m not completely opposed to DRM, I am against DRM which makes things more complicated than they need to be. The iTunes rental DRM is verging on the complexity of the DRM found in the original BBC iPlayer. And we all know what the net result of that implementation was. Another shock is the fact that the HD versions of these movies are only available on the Apple TV. The only possible reason for this is to place limitations on customers that aren’t there with physical media. Why? I’d add that releasing an updated Apple TV without PVR functionality seems like a missed opportunity from Apple, and would make the Apple TV a far more attractive proposition. Can the Time Capsule storage be used for anything else? Can Time machine back up to normal wireless disks (Not Yet!)? 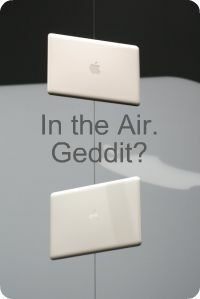 How hot will the MacBook Air run? What do you think of the Macworld 2008 announcements?